Drummondville, QC – The QMJHL was just 14 seconds away from heading to a series-deciding shootout for the second straight year but a perfectly executed offensive zone faceoff allowed Russia’s Dmitry Zavgorodniy (Rimouski Oceanic) to tie the score at two, securing Russia’s fourth-ever CIBC Canada Russia Series victory. Blueliner Saveliy Olshansky became the first defenceman to ever record five points in the annual event, hammering home a one-timer for the overtime winner 1:35 into the extra frame to put an exclamation mark on a 3-2 victory while giving Russia an 11-7 series win in points. Russia’s goaltending was up to the challenge once again as Columbus Blue Jackets prospect Daniil Tarasov took over in the crease to provide 34 saves as Team QMJHL fell short despite outshooting Russia 36-25. Anaheim Ducks prospect Antoine Morand (Halifax Mooseheads) opened the scoring to bring the 2,719 at Centre Marcel Dionne to their feet, blazing down the left wing to lift a quick shot over the shoulder of Tarasov with assists from Rafael Harvey-Pinard (Rouyn-Noranda Huskies) and Justin Barron (Halifax Mooseheads) at 8:42. Tarasov would deny 2019 NHL Draft prospect Raphael Lavoie (Halifax Mooseheads) on a one-timer from the slot late in the first to keep his squad within one and resumed his fine play into the second as Team QMJHL outshot Russia 14-6 in the middle frame. Both Alexis Lafreniere (Rimouski Oceanic) and Joseph Veleno (Drummondville Voltigeurs) had grade-A chances in the second, breaking in alone to be stopped by Tarasov as the game spilled into the third period with the ‘Q’ still holding a 1-0 lead. Russia went to work shortly after the flood as Stepan Starkov notched his series-leading sixth point, finding the back of the net for the second time with help from Pavel Shen just 19 seconds into play. Team QMJHL would respond at 8:40 though, with Drummondville teammates Veleno and Nicolas Beaudin working together to set up New York Islanders prospect Noah Dobson who gave the ‘Q’ a 2-1 lead. Zavgorodniy’s tying goal came on a clean faceoff win by Artyom Galimov. The Calgary Flames prospect snapped a wrister over the shoulder of a screened Olivier Rodrigue (Drummondville Voltigeurs). Zavgorodniy would join fellow QMJHL Russian teammate Alexander Khovanov with an assist on Olshansky’s overtime winner as Russia claimed its first series since 2014. Russia went 1-for-6 on the power play while Team QMJHL was held to 0-for-3, marking the first time in event history that the CHL has gone an entire series without scoring on the man advantage. The three leagues went a collective 0-for-19 on the power play while scoring the lowest output by the CHL in event history, managing just nine goals over the six games. The aforementioned Starkov led the series in scoring, registering points in five of his six games played for a total of two goals, four assists and six points. Boston Bruins prospect Pavel Shen led the event with three goals while Olshansky led blueliners with five points (1-4–5). Russian netminders Tarasov (1-2, 2.33 GAA, .915 SV%) and Pyotr Kochetkov (3-0, 0.67 GAA, .978 SV%, 1 SO) were also instrumental in their team’s success. For the CHL, four players led the way with two points each including Team QMJHL’s Harvey-Pinard (Rouyn-Noranda Huskies), Team OHL’s Barrett Hayton (Sault Ste. Marie Greyhounds) and Team WHL’s Connor Dewar (Everett Silvertips). 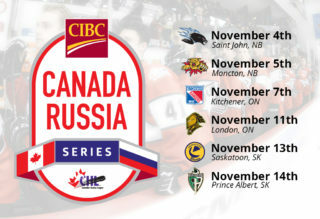 The CHL wraps up the 16th edition of the CIBC Canada Russia Series with an overall record of 63-26-1-6 while Russia has played to an all-time mark of 33-60-0-3.